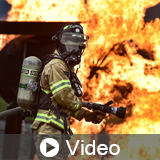 M-Fire core products defend wood framed buildings from the advance of fire making fire fighters jobs safer as we try to save wood framed buildings from total fire consumption. Describe the history of wood frame construction in the United States and the environmental impact of wood products derived from premature tree harvesting. Review why mid-rise light wood-frame buildings burn down so frequently during the framing phase of construction. Identify fire protection strategies to design safer and more sustainable buildings for occupants and first responders. Explain how wood products treated with fire inhibitors may contribute to LEED v4 BD+C projects.